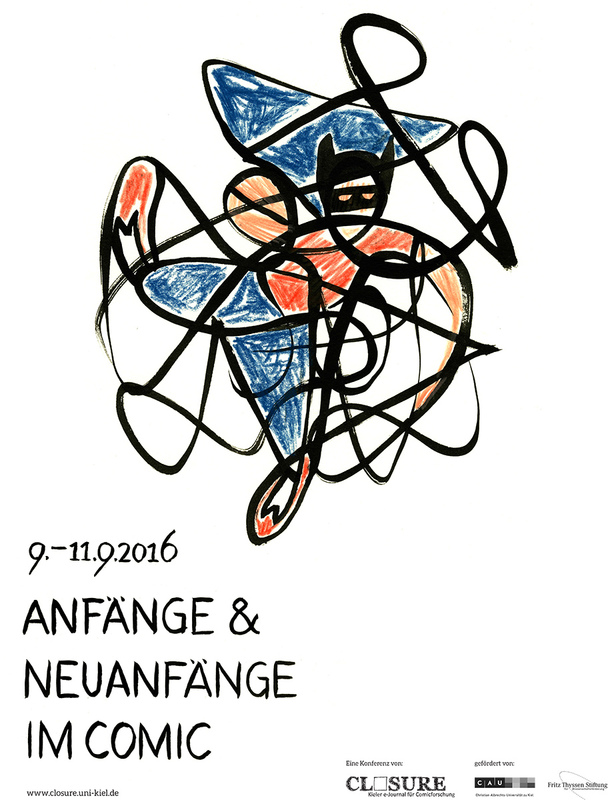 Organised by the editorial team of CLOSURE, Kiel University’s e-journal for comics studies, Kiel’s first comic conference will be held from the 9th to the 11th of September 2016 at the University of Kiel. The conference focuses on ›Beginnings‹ and ›Renewals‹ in comics and takes into account both formal and historical aspects of the genre. The conference explicitly seeks to approach this topic from an interdisciplinary perspective. Panels consist of 11 papers delivered by international comics scholars, a keynote address by Silke Horstkotte, and a concluding panel discussion. 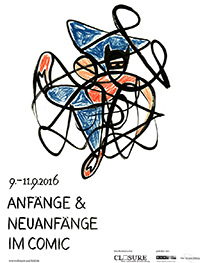 On Friday night, the conference opens with a comic book reading at the art gallery in Kiel. Four comic book artists – Tanja Esch from Hamburg, Jul Gordon and Sascha Hommer (»Kontaktcenter Hamburg«) and Gregor Hinz (comic magazine »Pure Fruit«) – read from their respective works, thereby approaching the topics of Beginnings and Renewals from a performative perspective. Presentations and the comic book reading are free of charge and open to university members as well as to the general public. “On your marks! More than any other narrative field, graphic storytelling is determined by beginnings. Case in point: 2012 saw the newest in a long line of reboots, as DC comics renumbered and restarted its series and its universe. It is not just the context of serial superhero stories, however, that is characterized by ›beginnings‹ and ›renewals‹ – any historical perspective requires both comics and comics studies to re-examine the question of beginnings. The Sleepless Nights of Major Stefanov. Uncertain, Endless Beginnings in the Bulgarian Comic of the Eighties.